I play a lot of pen and paper roleplaying games that use printed character sheets that are fairly simple but easy to misplace. I wanted a cross-device way to make/save character sheets without mucking around with user accounts or even a database to store them in. The current URI length limit is 2038 characters, which when compressed is a lot of dataspace in a hashtag so I'm using it! For the pre-made sheets: Simply fill out your character and press "Save". The character data will be converted to a JSON string and then URI-safe compressed and placed in the hashtag. Load up that page with the hashtag and the script will decompress the JSON string from the hashtag and populate the form! I use Google Chrome so once I bookmark a character they become available on every device I have! 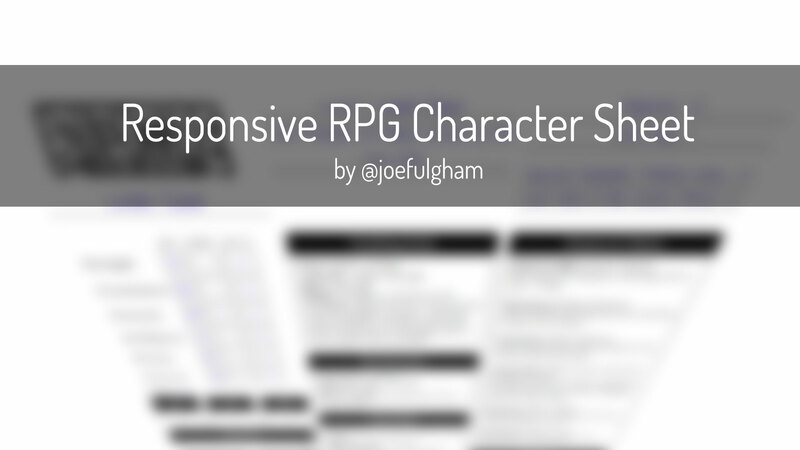 Character sheets for new games can be made by creating an HTML form with the id "charSheet". Note: Each form element requires a unique Name attribute. Then simply include jQuery and charsheet.js and the script will take care of the rest! Masks RPG - Core playbooks plus a Villain sheet! These should be future-proof, but if I ever have to break the save/load formatting I'll make sure the old code is still available to load your characters. Webmaster - My Spidersona as a Masks RPG "Janus"
Note that I cannot guarantee saved characters on these will continue to work, so use at your own risk! These are here simply because I've planned to do them and have started in some fashion. Monsterhearts 2 - making my way through the Skins. Let me know if you find errors. I bought Downfall and want to try making a "shareable" set of sheets for it. Possible it'll work better with simply a shared Google Doc though.